The kidneys are one of the bodies vital organs needed for survival, but do people really know what they do and what happens when they don’t function properly? A recent study was conducted by the National Kidney Foundation with results posted in the May 2015 issue of Nephrology News and shows that one half of Americans do not know how the kidney works or understand what the kidney does. More than 1000 adults were surveyed. 46% were able to identify that the kidneys produce urine, 54% were unable to identify this basic function of the kidneys. 63% have never talked to a healthcare professional about their kidneys or their kidney health. 71% were unable to identify the signs and symptoms of kidney disease. These numbers are a cause for concern because the CDC reports that 1 in 3 Americans is at risk for developing kidney disease. 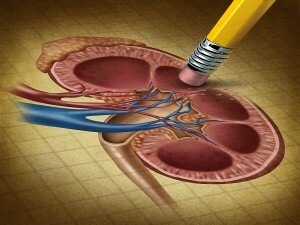 WHAT DO THE KIDNEYS LOOK LIKE AND HOW DO THEY WORK? The kidneys are fist sized bean shaped organs that are located in the lower back just below the diaphragm. They are each attached to a renal artery and vein that supplies the blood for filtering and also attached to a ureter that drains the urine into the bladder. The renal artery carries in 600 milliliters of blood per minute, (about 2, 12 ounce cans of soda), where it passes through the glomerulus and the nephrons. The glomerulus is the first part of the filtering system through which the blood passes. The blood then passes to the Nephron, the main part of the filtering system, and where most of the waste products and excess fluid is separated from the blood and passed to the ureter and eventually out of the body via the bladder. The filtered blood then goes back into circulation through the renal vein. In a 24 hour period approximately 180 liters of blood is processed and filtered, producing about 1.5 Liters of urine. IS FILTERING THE BLOOD THE ONLY JOB THE KIDNEYS DO? Stimulate the production of Red Blood Cells. The kidneys release a hormone called Erythropoietin when it senses there are not an adequate number of Red Blood Cells carrying oxygen in the blood passing through the filter. The Erythropoietin travels to the bone marrow via the blood stream and stimulates healthy bone marrow to produce new red blood cells. Blood Pressure control. Two important hormones are produced to help regulate blood pressure. One Renin and the other is Angiotensin. These two hormones help regulate the amount of salt and water the body retains during the filtering process and they also help with controlling how the blood vessel walls expand and contract as the heart beats. If there is too much water in the body, blood pressure goes up, if there is too little water, blood pressure will go down. Release the active form of Vitamin D to aid the body in absorbing calcium from the blood into the bones. The active form of vitamin D is the hormone Calcitriol. This hormone helps the kidney absorb the correct amount of calcium and phosphorus to allow bones to remain healthy and strong. Calcitriol travels through the blood stream to the intestines where it binds with calcium and carries it to the bones. Control fluid balance in the body. The ideal percentage of fluid content in the body is 55% for women and 60% for men. It is the kidneys job to maintain a proper balance of what fluid is consumed versus what is lost in the urine. Eliminate certain medications and toxins from the body. Sometimes healthy kidneys develop an injury or disease that causes them not to function properly. If it happens for a very short time, it usually does not create a problem. However if the kidneys are not working properly for an extended period of time, the person will develop Chronic Kidney Disease or CKD. Chronic Kidney Disease means that there is a long term decrease in kidney function as the healthy cells of the kidney slowly stop working for a variety of causes. As it progresses and more damage occurs, complications such as high blood pressure, anemia (low blood count), weakened bones and poor nutritional health can occur. In the early stages of kidney disease, people may not even know they have a problem until one of the above complications appears. Chronic Kidney Disease can actually progress to the point where Kidney Failure occurs, especially if undetected and the cause left untreated. Chronic Kidney Disease is becoming an increasing worldwide public health problem. In 1990 CKD ranked 27th on the list of causes of death worldwide. In 2012, it had risen to 18th place on the same list. The National Kidney Foundation reports that 26 million Americans have CKD and millions of others are at risk of developing the condition. Diabetic Nephropathy: People who have diabetes have an increased risk of developing diabetic nephropathy that leads to CKD. It occurs to 1 in 3 adults with diabetes. In diabetic nephropathy, the tissues of the glomerulus and the nephrons harden and die off and are no longer able to filter the blood properly, eventually leading to Kidney Failure. Diabetic nephropathy has been found to be more common in certain ethnic groups such as Blacks, Mexican Americans, Polynesians and certain American Indian tribes. Hypertension or High Blood Pressure: High blood pressure is the second most common cause of CKD. It occurs to 1 in 5 adults with high blood pressure. Long-term, consistently elevated blood pressure can damage the small blood vessels and glomerulus in the kidney. Damage can also occur to other tissues in the kidney causing CKD to appear and progress, leading into kidney failure. Risk factors for high blood pressure as the cause of CKD include poorly controlled high blood pressure, being of an older age and the presence of another kidney damaging disease such as diabetes. It is interesting to note that Blacks are at an especially increased risk for high blood pressure caused CKD that leads to kidney failure. Chronic Pyelonephritis also known as a chronic kidney infection: People who have an altered anatomy of the urinary system are more prone to frequent bacterial urine infections. The altered anatomy causes the urine to back up into the kidney and cause damage to the glomerulus and the nephrons. Some common causes of altered anatomy include kidney stones and other obstructions. Left untreated these infections can progress from CKD to kidney failure. Signs of a kidney infection can include: fever, feeling of tiredness and fatigue, as well as lower back and flank pain. Renal Artery Stenosis or occlusion: Stenosis is a narrowing of the main artery or one if its branches going into the kidney. Blood is still able to pass through, but at a slower than normal rate. Renal artery occlusion is where the artery or one of its branches is completely blocked allowing no blood flow into the kidney. This causes the tissues of the kidney to harden and die, no longer able to function properly. Stenosis or Occlusion of the artery can occur because of a blood clot or hardening of the arteries. People with an artery occlusion will typically have steady lower back pain, abdominal pain, nausea, vomiting and blood in the urine. Polycystic Kidney Disease: This is usually an inherited condition that occurs when fluid filled sacs slowly grow and crowd out the healthy kidney tissues and can lead to CKD and eventual kidney failure. WHAT ARE THE SIGNS AND SYMPTOMS OF KIDNEY DIEASE? Prolonged loss of appetite or no desire to eat. Night time muscle cramping, especially in the legs. Skin may turn a yellow-brown almost bronze color. Most often CKD is suspected when the blood levels of BUN and Creatinine are noticed to be elevated during a routine check-up. BUN is the abbreviation for a Blood Urea Nitrogen level. Urea nitrogen is a natural waste product produced from the combination of the breakdown of foods that is eaten and the body’s build-up and breakdown of tissues. Creatinine comes from all muscle activity. The body has no use for these waste products so healthy kidneys will remove them from the blood and send them out of the body in urine. The BUN and Creatinine levels in the blood will start to rise when the glomerulus and nephrons don’t filter as efficiently due to cell hardening. If the levels remain elevated for 3 or more months, then a person is considered to have Chronic Kidney Disease. Doctors will use the BUN and Creatinine levels to determine the Glomerular Filtration Rate or GFR. The GFR is the best test to determine how the kidneys are really functioning. It lets the doctor know how fast the waste product is being cleared from the blood. It is calculated using the blood creatinine level, age, weight, race and gender and is reported in milliliters/min. The GFR is used to determine if you have CKD and what stage you are in so that a treatment plan can be developed to slow the progression of the disease. A Renal Ultrasound may also be ordered to see the size of the kidneys and check for any structural damage to the kidney or urinary tract. An abdominal CT scan may also be ordered. Doctors will also take urine samples to check for the presence or absence of protein and micro albumin in the urine. They will also check to see if any infections are present. Normal aging process. People over the age of 70 have an increased risk of kidney disease. People who have more than one risk factor on the above list have an even greater risk for developing CKD and should be talking to their doctors about what can be done to prevent CKD If CKD is thought to be present, testing should be completed to confirm the diagnosis and a routine follow-up and management plan put in place. For example, high blood pressure should be treated with a goal of maintaining blood pressure at less than 130/80 through the use of medications and diet restrictions of salt. Diabetes should be controlled with an ideal Hgb A1C of less than 7.0. Stopping smoking and starting an exercise program can also help slow the progression. The goal of minimizing the risk factors is to prevent the Kidney Disease from progressing to the point where the kidneys fail and more aggressive treatment such as dialysis is needed. In the next article, we will talk about Kidney Failure, End Stage Renal (Kidney) Disease and the treatment options that are available for patients who develop End Stage Renal Disease. Cheuck L,DO , Gest,TR,PHD. (Oct, 2013) Kidney Anatomy. Medscape Drugs and Diseases. One Response to "Healthy Kidneys and Chronic Kidney Disease – Part 1"
Hello! I know this is kinda off topic nevertheless I’d figured I’d ask. Would you be interested in exchanging links or maybe guest writing a blog post or vice-versa? My website addresses a lot of the same topics as yours and I think we could greatly benefit from each other. If you’re interested feel free to shoot me an e-mail. I look forward to hearing from you! Wonderful blog by the way!